Mar. 28, 2018 10:51 a.m. 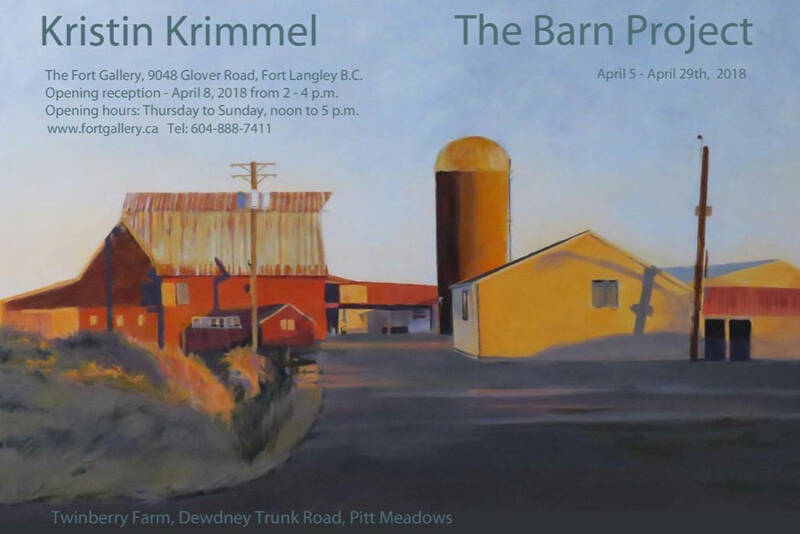 In her latest project, artist Kristin Krimmel celebrates the beauty of farmlands in the Maple Ridge-Pitt Meadows area. The Barn Project, running at the Fort Gallery in Fort Langley April 4 to 29, features 12 graphite drawings and several acrylic paintings. Krimmel, who moved to Maple Ridge 11 years ago, says the landscape of the farmlands along the Alouette River are soothing to her, particularly the many barns she passes when driving from her home to Vancouver. Over the years she has taken every opportunity to photograph these barns, but has not done anything with the images until now. “I kept asking myself where the fascination came from,” Krimmel said in her artist’s statement. “Was it that my grandfather had come from farmland in Friesland (Netherlands) and had farmed in northern Manitoba? Perhaps. Or that farm and rural land is being absorbed by the ever-growing pressures of the mega-city? And what was I going to portray? Krimmel says the barns are drawn in a realistic way, and many of them are based off photos taken so long ago, she’s forgotten where they were. “It seems a pity to me that some barns are being modified into housing and some are being torn down,” Krimmel said. “That natural disintegration of a structure which is no longer maintained can provide some interesting visual modifications to the original. An opening reception for The Barn Project will take place at the Fort Gallery, 9048 Glover Rd., on April 8 from 2 to 4 p.m.